CENTENARY, Ohio — And then there was one. The Gallia Academy volleyball team is now alone at the top of the Ohio Valley Conference standings, as the Blue Angels defeated Fairland in straight games to give the Lady Dragons their first league loss. Gallia Academy (8-0, 7-0 OVC) led initially in the first game, but Fairland (8-6, 6-1) took its first lead at 4-3. GAHS scored five of the next six points and led the rest of the way to the 25-15 victory. The Blue Angels led wire-to-wire and had a perfect side-out percentage in the second game, ultimately winning it by a 25-6 count. After a trio of lead changes early in the third game, Gallia Academy took the lead for good at 14-13 and cruised to the match-clinching 25-17 triumph. GAHS — which celebrated a milestone, with junior Peri Martin earning her 1,000th career assist in the win — has now won 36 straight league matches and 25 consecutive OVC matches at home. The victory is Gallia Academy’s 14th in a row in the regular season overall, which includes a string of 10 straight sweeps. Gallia Academy extended another impressive streak on Thursday, as it was the program’s 24th straight victory over Fairland, dating back to 2003. Hunter Copley led the GAHS service attack with 16, including four aces. Taylor Burnette had 14 points and three aces in the win, while Martin, Ashton Webb and Alex Barnes each had five points, with five aces by Webb and two by Barnes. 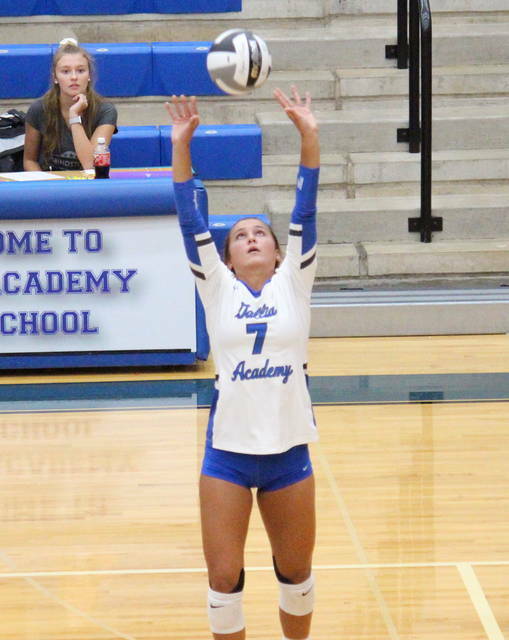 Maddie Wright rounded out Gallia Academy’s service with four points and a pair of aces. Webb led the hosts at the net with 13 kills, followed by Barnes with 11 kills and a block. Maddy Petro contributed three kills and three blocks to the winning cause, Wright chipped in with three kills, Martin came up with two kills and a block, while Aubrey Unroe added one kill. Barnes and Burnette led the Blue Angel defense with 10 digs apiece. Martin recorded 31 assists in the win and now has a career total of 1,008. Kelsie Warnock led the Lady Dragons with five points, followed by Taylor Webb with four. Allie Marshall ended with three points, while Jenna Stone added two. These teams are scheduled to meet again in the season finale at FHS on Oct. 11. Gallia Academy returns to action on Monday at Jackson.